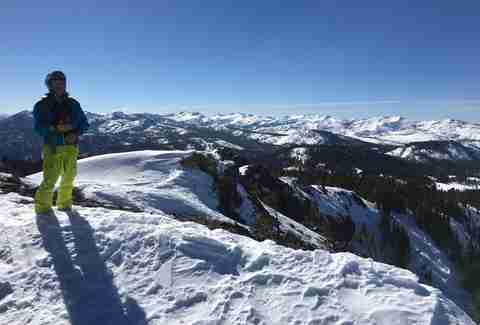 Everyone who lives in San Francisco has at least one friend who’s obsessed with backcountry skiing. You know this because people who backcountry ski are kind of like vegans: they make sure you know about it within minutes of the first meeting. 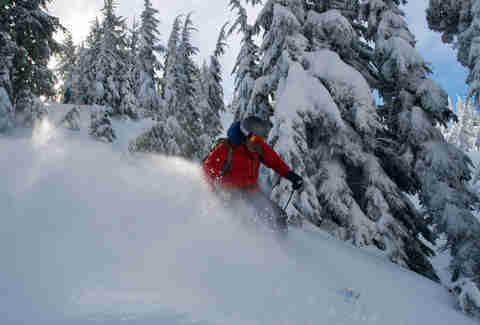 Backcountry skiers can’t help themselves. They’re stoked on what they do, so they’re always talking about the avalanche course they just took or the new skins they got for their skis, and they’ll take any chance possible to force you to watch hours of GoPro footage from their epic day of skiing off-piste. The difference between vegans and backcountry skiers, however, is that I’m actually jealous of my friends who get to experience the backcountry snow -- jealous of the untouched snow and lack of resort crowds, that is. The other part? The part where they have to hike for hours and hours to get to that untouched snow? Yeah, I’ll take a chairlift any day over a crazy multi-hour trudge up the mountain through feet of stubborn snow. 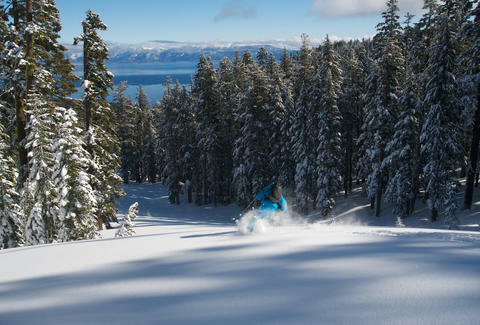 Which is why I was pretty stoked when I found out that Homewood Mountain Resort on the West Shore (best shore) of Tahoe now offers a “Snowcat Adventure,” in which a pimped-out snowcat transports skiers and riders above the resort’s boundary to access over 750 acres of backcountry terrain. Translation: too lazy to hike, but still want to get that untouched pow? Snowcat skiing at Homewood is the way to go. Yeah, you aren’t “earning your turns” like backcountry skiers, but who cares? It’s super fun. But just to make sure, I went and checked it out for myself. You know: research and whatnot. There’s no sleeping in on a snowcat day, as I had to be at the mountain by 8am so that I could get hooked up with avalanche gear and a quick safety lesson from guides, Alycia “Fish” Glines and Laura LaPlante, on how to use it all. Good news: the beacons are truly easy to figure out -- and important to wear -- since even though the guides are trained to take you down spots where the snow (hopefully) won’t slide, there’s always a risk. After we strapped on our beacons and packs with probes and shovels, we headed up the lift to meet the cat at the top of the mountain. Fun fact: Steve Smith, the driver, bought the snowcat from another resort six years ago, but totally pulled it apart and rebuilt the entire thing, including a custom design for the passengers. Fancy! The snowcat has seats for 10 people, which is the maximum number of skiers and riders (minus the guides) on each adventure; I learned the hard way to buckle my seatbelt -- we went up some legit steep terrain that had me sliding out of my seat. The cat goes about 8mph, but it’s a crazy ride, as it often comes within an inch of trees, rocks, and cliffs. I’m scared of heights and even though I knew I was in good hands, it definitely got my heart racing. Homewood has a permit to operate the snowcat on US Forest Service lands, which is kinda the whole point of the experience. It took about 20 minutes to get us nearly almost all the way up Ellis Peak, then a short hike took us to the very top of the peak, where we soaked in the incredible 360-degree view -- while standing 8,740ft above sea level. Yeah, that’s right: I was crying... and I hadn’t even started riding yet. I was super lucky the day I did the cat adventure; there was a storm a few days before so there were several feet of untouched, creamy powder everywhere we went. I don’t want to be that chick who brags about how she shredded the gnar -- or be the chick who says stuff like “shredded the gnar,” for that matter -- but I will say the experience was epic in every sense of the word. The guides led us down tree runs, steeps, glades, and bowls, making sure we knew where to go at all times, and didn’t accidentally ski over any cliffs -- since that was actually a thing that could happen. There was some major hiking at points and definitely some spots where we did a lot of traversing, especially for me and the other snowboarders, but pretty much every run (you can get anywhere from five to 10 in a day) and every turn was total perfection, including the last one, which was a total of 1,828 vertical (and exhausting) feet. I’ve never wanted a beer so badly in my entire life. So is the Snowcat Experience for you? Clearly, I vote yes. It’s an awesome experience you’ll remember for the rest of your life, even if it can get a little pricey. Only thing: Homewood requires that all participants be advanced skiers or snowboarders (although they will do private tours for intermediate level skiers/riders with a full buyout). I was worried perhaps I wasn’t qualified, since I have zero backcountry experience and have only ever ridden powder in bounds at a resort, but I was pretty comfortable with all of the terrain (and excited to push myself in the areas I found challenging). The guides are awesome, explain everything you need to know, and stay with you throughout to make sure you’re holding up. Miracle March (and hopefully April) is still in full effect, so even though spring is almost here, there’s no reason to wait until next year to get out and get yours. Daisy Barringer is an SF-based writer who often wishes she were a Tahoe-based writer. Follow her on Twitter @daisy.